As a single woman with a career, a social life, and entrepreneurial dreams I often find myself busier than a honey bee in the peak of Spring. A busy schedule is the perfect opportunity for distractions to take over one’s life. Personally, I must own the fact that I fill my schedule with “important” things to do because it’s more comfortable than sitting still or being alone. Alone. Let’s explore that for a minute. Is the single life supposed to feel, alone? With no significant other to worry about caring for or spending time with. Does the single women find herself in a depressed state of loneliness and desperation? No! That’s not what I’m saying. Not completely anyway. Years ago, I think I may have replaced those feelings of loneliness with my Tuesday evening Skype meeting. I replaced my desperate moments with another business goal. Without really realizing it I shifted my focus to “schedule-fillers” that gave me a false sense of purpose. Let me pause here. The ventures I’ve taken on during the last few years, the new responsibilities you’ve taken on, have not been a waste of time. Au contraire! Anything we focus on and bring positive energy to flourishes and becomes an avenue for others to see the light that lives within us. Here’s where so many women like me (maybe this is you too) fail. We forget why we’re here. 401K goals, social meetups, start-ups, investments, saving plans, FICO scores, down payments, retirement funds and travel excursions become our focuses! We were created to serve others like Jesus did and tell others about the goodness of the Lord. Is this something we didn’t know already? Of course not, it’s just not always in the forefront of our minds. 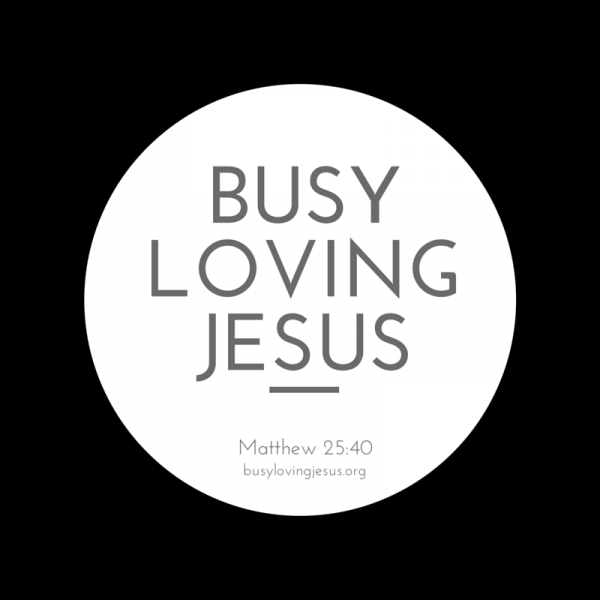 So, what is BLJ – Busy Loving Jesus? I was given the vision to create a community that is completely dedicated to loving Jesus by serving others- by serving those in need. It’s a bridge to help us all find opportunities to serve in our local communities. Because Jesus did not come to be served but to serve others (Matt 20:28), and we all are without question called to be more Christ-like everyday. Instead of doing things that bring us pleasure and feed our egos, let’s get busy doing the work of The Lord! Are you looking for opportunities to serve others? Do you find yourself penciling in “schedule-fillers” to avoid having “nothing” to do? Are you a woman (or man) with a heart for serving others ? BLJ is the perfect community for you! Sign up to be placed on our mailing list! Like our Facebook Page. Follow us on Instagram and Twitter! Our first service project is launching in Dallas, TX – December 2015! P.S. Do you have an idea for a service project in your local community? Have you seen a need that needs to be filled? Complete the form found here and submit your idea for serving others today!